Ever since I came across this variation of hummus I have been dying to try it. The thought of adding roasted red bell pepper brought to my mind a 'smoky - sweet' capsicum flavour and immediately I found myself craving for it :D Glad that I finally made it. Came out pretty well as expected. A very simple and easy dip that tastes best with pitta bread. You could also use it as a healthy dip for fritters or spread for making sandwiches instead of mayonnaise. 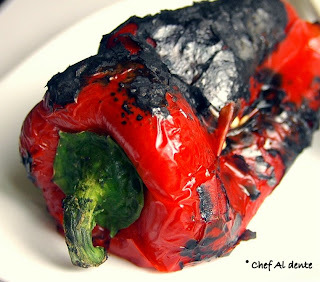 Roast the red bell pepper - you can either grill it or roast it on the stove top . Once most of the skin has blackened, place it in a deep bowl and cover with cellophane wrap or a lid so that it will sweat in its own heat. After 15 - 20 mins, peel off the burnt skin (you can dip it in water to remove the tiny bits) with your hands and chop it roughly into small pieces. In a heavy duty blender / grinder, add the chopped roasted red bell pepper and all the other ingredients (except red chili flakes) and blend into a smooth paste. If it is too thick add few teaspoons of water. Do a taste test and modify with added salt, tahina, lemon or red chilli powder to suit your taste. If you like it more garlicky, you can use more garlic as well. Serve it as a dip with freshly toasted pitta bread and green salad. Oh..I'm making hummus tonight..love it. Will try this variation next time. Love the red bell pepper hummus a lot,beautiful color u have got!! Indeed this is a great alternative way to enjoy hummus. Awesome, love that beautiful color..
Nice vibrant color and looks so lovely !! delicious !! great colour and flavour than the regular one..
wat a lipsmacking dish...looks delight..! Shall definitely try this sometime. Such a attractive coloured hummus and great clicks are making it so much more tempting! !